This one was just as fantastic as #1 (just as BIG!! ), and having a totally different perspective from book #1 made this story that much fuller. More complete. More real. More tragic. Allowed ALL of us to grow. Hayling: The second is just as beautiful. In terms of writing, it might actually be better. No sophomore slump, that’s for sure. I thought re-reading the college years from Daisy’s POV was fascinating. Suanne’s really careful to re-tell scenes only if you learn something new from them, or go deeper into a moment. And then in the…um….”Adele years”, it’s a totally different and new book. Can’t wait to hear your thoughts on it! Suanne Laqueur, Author: Can I TELL you when Adele released “Hello,” I nearly passed out?!?!? Maryse: it’s the PERFECT song. It’s SO BIG, just like the book. LOL!!! Michelle: The writing is so real. Feel like I’m sitting next to him , experiencing and seeing what he is. The writing reminds me a little of Making Faces. One of my all time favorites. 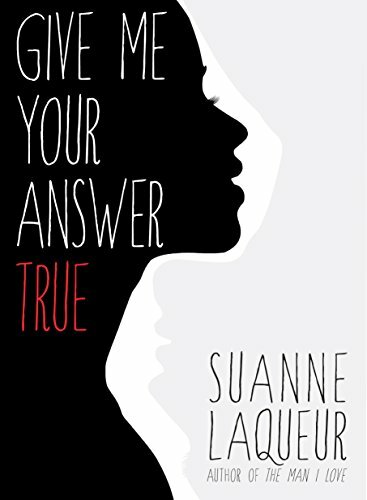 Suanne Laqueur, Author: True story: I wrote the first line last. But most of all, HER POV (this one) was SO needed. Gave us so much relief, but not before it gave us the ultimate heartache. I cried. Daisy swallowed hard. She had never known such weary sadness. A despair that was hollow and decayed like a rotting tree. The intensity of the emotions in this story? Incredible!!!! P.S. Here is my review for book #1 (Book Review – The Man I Love by Suanne Laqueur), which was originally supposed to be the only book, but we got lucky!!! 😀 The author expanded their world into the one I HAD to live. By the end of book one, I was desperate to be her. You’ll see why. If you haven’t read book #1 yet, I recommend you skip… or maybe skim this review lightly. I’m going to short form this as I need to tell you what I experienced, and not so much “what you’ll be reading”. Because what you will be reading, will affect you deeply if you don’t know what you’re getting into. Which is… real life. Real life and real people (albeit a little “magical” in feel, due to this being a ballet troop, with all that theater beauty dusting the scenes with ballerina fairy dust 😉 ), But this is mostly college life… and then adult life. Real love, real friends, real tragedy, real mistakes, real reactions, real consequences, real drama, real pain, real victory. Stuff that some right here, if I dropped a few keywords, might shy away from. But don’t. It’s intense. It’s an experience. It’s unforgettable. This is an epic love story. Romance? I dunno… guess it depends on who you ask? Love story for sure!! HEA? I dunno… well actually I do. 😉 And it is SO worth the journey, no matter the outcome, but OMG the outcome was WOW!!!! Especially in THIS book. While both books can absolutely be read as standalones, they also 100% compliment each other, as they are both from two different POVs, from both main characters. Both are equally as good as the other, these stories are best experienced going in blind. Even the blurb of the original book (in my option) gave something away (that YES!!! Was an absolute eye-catcher and would have made me want to read the book BECAUSE I wanted to go through what they went through), but going in blind meant I was sufficiently shocked. I didn’t see it coming and was able to experience this book that much more. There are a few things that sufficiently shocked me in book #1, so to experience those things again, in book #2 (but from a totally different perspective)… well. Wow. Just… WOW!!! THIS kind of story, with this kind of “living” is what makes books with one event, but two POVs, worth reading. And lemme tell you, both POVs, while they reflect many of the same events, also have a TON of different “living” in them. Trust me on that. And even during the “same scenes” the experience and thought process going on with both characters was SO different. Complementing or absolutely opposing but expanding upon, and exactly what you’d expect and want from two books focusing on a time period shared by two people. And not just that… this is one of those that spans years… and in years is growth, failure, love and loss, and still… that connection that ties them both. That ties them all. Well… if you start with this one (and you can), it’s about students in college, in a theater major, with ballerinas (and ballerinos? LOL!! What do we call male ballet dancers, anyway? ), that become friends as the sessions progress. Juniors and seniors and some that are up and comers and about to take the ballet world by storm. And some back stage technical “hands” that fall head over heels in love with some of ’em. Best friends, roommates, newcomers and teachers alike. They become an unstoppable team. Until something stops them ALL. “…when she glanced up, she saw only a broken little brother. And in spite of her anger, it cracked her heart. Oh at first the obvious is the only thing we’re thinking about. And even when it looks like all will work out… that which we didn’t even consider becomes from row and center as these “friends” cope as best as they can. Together. A nervous twist in her stomach. A feeling this was the price she paid for something. But she couldn’t remember what. And betrayal, absolute incredible heartache and self-loathing destroy them all. Or does it? Daisy closed her mouth up in a hand and nodded through tears. OMG WOWWWWW!!! That scene… that realization. That personal, agonizing truth. A sweet boy with a bitter palate, Daisy thought. AND THAT, my friends, is the journey. This is no sweet candy “fluff” read, all wrapped up in a bow. No matter how exquisitely written, this gets ugly. You have to be all right. Don’t scream. The men you love cannot bear it. If you can’t be it, act it. This gets destructive. This gets uncomfortable. And despite it all, this is SO beautiful. OMG I almost feel like THAT quote is the key (or at least one of the BIGGEST <— ;)) keys to life, right there. An epiphany. Perfection. While I think I liked it even better than #1, I did find it to drag a bit in the last third (I can’t say exactly what, due to spoilers of the experience as a whole), but none of that matters in the long run. Her tentative joy was studded with the sharp edges of broken glass and her dreams began to twinkle with it. GAH!!! The writing is so beautiful!!! It’s a love story that I won’t soon forget, and #3 will be coming out shortly. Even though neither book ends on a cliffhanger (so you won’t be furious upon finishing) ;), I just love these characters, and I can’t wait for more. 4.5 stars for this one too! Great review, Maryse. I love the quotes you chose and I’ve had a hard time moving on to other books. The writing is just awesome. I can’t wait for book 3. Me either!!! ‘Cause you TOTALLY know where we are going with that one. Thank you for coming back to me! OMG OMG OMG!!! I TOTALLY saw Mary Steenburgen as Rita, too. WOW!!!!! I love your Pinterest! It’s as if she’s a writing genius. You may have noticed I shamelessly plug Philip Pullman’s “The Golden Compass” in GMYAT. Maryse, please tell me you’ve read it? Or you have plans to? Please don’t die without reading it. I haven’t *shamefaced* but I will read it. I did LOVE that part, and how he sent her book #2 and she was so excited to have that to read also. YES YES I have to read it. Key words and a love story. OMG, The Golden Compass and the rest of His Dark Materials (Subtle Knife, Amber Spyglass) is seriously some of the most beautiful writing I’ve ever read. I re-read them every year. They’re so beautiful and I really am offended that daemons don’t exist in real life. Seriously, why is this not a thing?? Tee hee!! No do it. Trust me. There’s a book 3?! GAH! When? Maryse – loved your reviews! I just finished reading both books too and I’m anxiously tapping my fingers for book 3. These are by far favorites of mine this year (5 stars each for me)! Dais & Eric were just… Ahh… BIG (that’s totally the right word). The depictions of their struggles in the years following their trauma were so real, especially the story-telling in the initial therapy sessions and then the digging! I’ve done some digging in my life, and I find that it definitely helps with the acceptance phase, especially because it can bring some sort of sense to absolute nonsense in this world. Suanna – Awesome! Beautiful! Gut-wrenching! Emotion evoking! Real! I couldn’t stop reading and wanted to keep reading when they were over. Cannot wait for book 3!! I immediately picked up The Golden Compass as I was intrigued after reading that section in GMYAT. 🙂 Thank you for these wonderful stories! YES to all of the above. I lost myself in these two books. I think I enjoyed GMYAT a bit more just because of all we learned about everyone. There was amazing character development, and when I finished I had a moment of, “Oh, right. These people don’t actually exist.” I love it when that happens. I loved the writing, the characters, pretty much everything. Thanks again, Maryse, for reviewing these. I don’t think I’d have found The Man I Love on my own. Here to Stay will be released on January 14. I just ordered the first print proofs which is always exciting. I get to hold the baby!! Sounds like I need to totally prepare myself for these books! But I’m in! Moving them up on my list! So looking forward to reading these!!! OMG! I did not know there was a third one coming out!!! YAY!!! Wow, just wow…I finished reading the third and final of this series “Here to Stay” a couple of days ago and I’m having major post-series depression 🙁 Suanne, your story-telling and writing is so eloquent. I’ve never before felt so in-tuned with literary characters. In the first two books, I longed for the love and bond of the two main characters, and in the final book, it was the bond of their foursome friendships! Just beautiful!! I hope to read more from you in the near future…I’m officially stalking your page.